JANESVILLE --- Lacy, yellow-green heads bobbing in the breeze look like they belong. Though considerably taller, the patch of ridged stalks supporting the tiny flowers sways along with Iowa natives. Motorists along U.S. Highway 218 in Bremer County may not notice, or if they do, might wonder why the oddly unique plants dominate the ditch in places. Wild parsnip is not the only non-native, invasive species in the state. But unlike others, it bites when broken and its juices flow. "It is a dangerous plant for several reasons, and probably human health is at the top of the list," says Mark Renz, an authority on invasive plants at the University of Wisconsin. "It is one of the few that really is a problem and does fight back," Renz adds. When wild parsnip sap contacts skin exposed to sunlight, a rash leading to blisters will develop. The clinical name is called phytophotodermatitis. Lingering effects may include scars and discoloration of the skin that lasts up to two years. Some sources also list temporary or permanent blindness as a possibility. Described by botanist David Eagan as "the evil sister of Queen Anne's lace," wild parsnip is well established in Iowa. Authorities say it is now likely expanding its range. But the species is not well-known, according to Chris Henze, roadside vegetation manager and weed commissioner for Johnson County's Secondary Road Department. "I would say that the majority of folks in Iowa couldn't identify wild parsnip even after getting burned by it," he says. "A lot of people ask me about 'that yellow mustard' or 'wild mustard' when they actually are talking about wild parsnip." Aaron Andrews, a specialist with Iowa State University Extension, spends some of his days outdoors in farm fields. He was not aware of what a wild parsnip could do until after coming in contact with the troublemaker. Andrews did not feel anything initially, but the affected area produced a large blister. "When I did it, I thought, 'Well, I must have got burned by something," he says. His first thought, though, was of something hot, not a chemical reaction to a plant's juices. A bit of research revealed the likely culprit was wild parsnip. "Once you get burned and you look into it, you say, 'Yeah, I was out in a field,'" he says. "I was left with a scar there for three or four years before it went away," Andrews adds. Kirk Henderson is manager of the Integrated Roadside Vegetation Management program at the University of Northern Iowa. As his job suggests, he spends time in places where wild parsnip grows. On one outing, Henderson knelt on a stem while taking photographs. Sap from a wild parsnip got on his skin and chemicals entered his bloodstream. "It moved from one leg to the other. When a spot broke out on my back, we knew I had a problem," he says. Henderson's treatment required steroids and about four weeks' time. Despite his experience, though, he doesn't believe "a nuclear response" and panic are necessary. "A good goal would be to achieve an informed citizenry somehow without causing hysteria, a goal probably as old as civilization and disease itself," he says. The Wisconsin State Herbarium, established in 1849, maintains a collection of dried plants and includes 1 million specimens. According to its records, Pastinaca sativa, or wild parsnip, was recorded in Wisconsin as early as 1896. According to Eagan, how wild parsnip got to the United States is not clear. The plant may have been introduced as a garden vegetable or "in the cuffs of some immigrant's pants," he says. Either way, wild parsnip is prevalent throughout many states, according to Renz. Wisconsin's Department of Transportation distributes information about its dangers. The effort stems, in part, from an incident involving a road crew. "They were not familiar with this plant, and they had to take considerable time off because of it," Renz says. 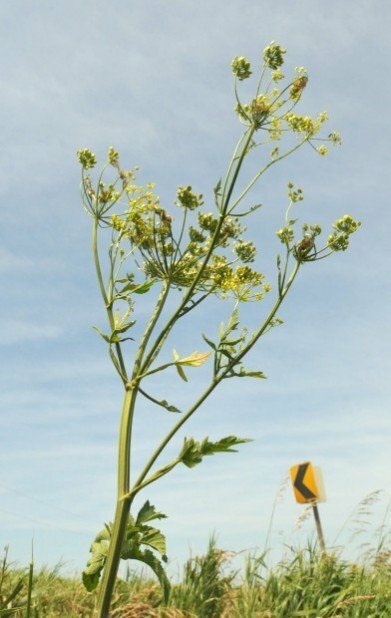 Henze's road crews in Johnson County have also come in contact with wild parsnip. "Some of the cases were pretty gruesome, and weeks later the blisters were still healing," he says. As a result, Henze leads annual sessions to educate employees. John Pearson, a botanist and ecologist with the Iowa Department of Natural Resources, has also heard horror stories. The worst involved a crew using string trimmers in a state forest, unaware that the dominant plant they were shredding was wild parsnip. "They were extensively splattered with sap-rich plant debris on a sunny day --- the worst combination of circumstances --- and had to be taken to a hospital for treatment," Pearson said. The workers figured out what had happened. Other less obvious situations may mask the cause. "Because the blisters do not appear until hours after the contact, it is easy for people to have no mental association with the blisters and the plant in the vegetation they walked through earlier," Pearson said. First the bad news: Unlike poison ivy, wild parsnip affects everyone. 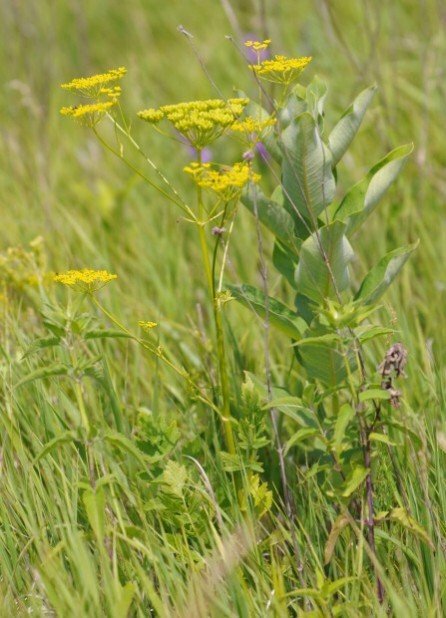 The University of Minnesota Extension Service also lists wild parsnip as a plant poisonous or harmful to horses, though toxic doses aren't known. On the positive side, a hiker could walk through a field of the stuff, but if no sap gets on skin exposed to UV light, the person would suffer no adverse reaction. And controlling wild parsnip, an aggressive Eurasian weed up to 4 feet tall, is relatively easy, according to authorities. Jabbing a shovel through the root just below ground level will kill the plant. Herbicides are also effective. Mowing can play a role, too, but must be timed appropriately. Care should also be taken not to come in contact with shredded leaves and stems that will inevitably be sprayed by whirling blades. For the same reason, experts advise against using string trimmers for the job. The best time to cut is after flowering and before seeds mature. Wild parsnip, though, will resprout, meaning additional passes with the mower. The process will likely need to be repeated in consecutive years. Not following that schedule could aggravate the situation, according to Renz, and likely did in Wisconsin. Hitting a mature plant with a mower broadcasts seed, he says. Seeds can also hitchhike on implements to new locations miles away. "The DOT was mowing when the seed was viable, and that's why we have so much of it," Renz says. "It's in our top 10 problem weeds in Wisconsin, probably top 5. Because it's everywhere," he adds. Consequently, wild parsnip is a regulated and restricted species in Wisconsin, meaning it is illegal to accidentally or purposely spread the plant's seed to uninfected areas. Wild parsnip is not on Iowa's noxious weed list, which includes about two dozen species, according to Henderson. "(Wild parsnip) is one of 12 plants we listed as Iowa's primary roadside threats in the Integrated Roadside Vegetation Management technical manual that came out last fall," Henderson says. "It is undeniably invading our roadsides," he adds. "Still, I would not lobby to put it on the state noxious weed list." If easily controlled, why is wild parsnip thriving? "It's not a hard plant to kill, but it's growing in areas that we don't manage very much. And that's why it's such a problem," Renz says. Those spaces include ditches, pastures, river banks and natural areas too large or too remote to police. And in Iowa, like other states, the cost of an all-out war on wild parsnip would likely be too costly and require practices no longer considered acceptable. "My opinion about control is that the battle may be lost as of now," Henze says. "It's so widely prevalent now that in order to eliminate it in most roadsides would require going back to blanket spraying rather than spot spraying --- which is what we've been trying to get way from for over 20 years now." Pearson also believes elimination is unlikely, but management might be possible. "Eradication is not feasible, so controlling its abundance in places where people actually go would be a more tractable solution --- combined with an education effort to alert people to avoid contact with it," he said.